We did it again! 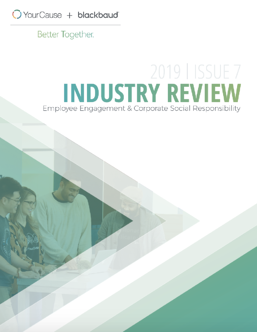 The YourCause team is excited to share our latest Industry Review focused on evaluating employee engagement and corporate social responsibility programs. This issue focuses on performance data collected and consolidated from the YourCause Employee Engagement platform, CSRconnect, between January and December of 2018. Throughout the following pages, we share trends, insights, and even provide some helpful tips for managing a successful employee engagement and corporate social responsibility program. It is our hope that readers use this data as a gauge for performance measurement within CSR. As always, we aspire to continue our tradition of challenging, questioning and improving the effectiveness of employee engagement efforts for both for-profit and nonprofit organizations. Please remember: the intent of this Industry Review is to encourage a better understanding of employee engagement and cross-program trends.